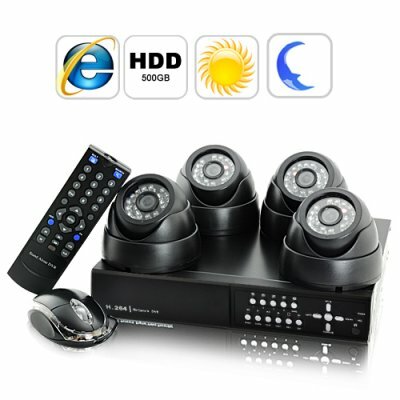 Successfully Added 4 Camera Surveillance System "SecureONE"- 4 Dome Cameras, H264 DVR, 500GB to your Shopping Cart. The SecurONE kit is a complete system for local as well as remote surveillance right out of the box. It features a state of the art H.264 digital video recording unit, four top of the line Sony CCD security cameras, a premium 500GB Seagate brand hard disk drive, and all the accessories you'll need for total private or public security without installation hassle! This Is State Of The Art: We're not trying to convince you of why you need a security camera recording system. That's obvious! The world isn't getting any safer. What we aim to do is show you why The SecurONE is better than those other security solutions you find on the Internet. While the reasons are many, here are the top ones. The SecurONE records video feeds using the H.264 MPEG-4 compression standard. Why is this important? H.264 offers the best video quality possible while maintaining the smallest file size possible. This is important because you'll be running your security cameras day and night and that's a lot of captured video. Not only does the SecurONE allow you to save surveillance feeds directly to a network or USB drive, it also comes with a internal drive for the most efficient method of video feed archiving. The SecurONE comes with a Seagate 500GB hard disk drive which is good for weeks of stored video. But if that's not enough, easily swap out the hard drive for something bigger. In-house testing has confirmed that the SecurONE is easily compatible with 1TB and 2TB drives. But there's more. The kit also comes with four Sony lens CCD dome cameras for the best balance of size and durability. Unlike standard or bullet type security cameras, dome cameras (because of their shape) are virtually indestructable. This is because all moving parts and cables are hidden by a very tough shell. You'd have a better chance of ripping apart a phone book with your bare hands than destroying a dome camera with a baseball bat. Seriously though, you have to ask yourself what good is a security system if potential thieves or kidnappers can easily disable your cameras. Made For YOU: Is your family important to you? Have you put a lot of work into making your house a home? Or your home a castle? Do you own a business which deals with expensive stock or sensitive information? Do you have cases and cases of fine wine in the cellar? What about the bearer bonds and stock certificates you keep in the safe in your bedroom closet? Do you enjoy the peace of mind knowing that you are in control of your world? Do you worry that society's moral values are going down the toilet? Is your success causing you to stand out amongst your neighbors? Have some undesirables moved into your neighborhood? Do you suspect one or more of your employees of dishonesty? Have your ever been mugged before? Has your house ever been broken into? Do you personally know anyone whose house or apartment was broken into? Do you agree that it's not just about loss of valuables, but the feeling of being violated which makes home or business burglaries so devastating? If you answered YES to any or all of these questions then you owe it to yourself to acquire the SecurONE complete surveillance kit. Location, Location, Location: Set it up in the den so you can monitor the most important bedrooms in the house. Yours and your kids. Or locate the complete system at work. One where the most important documents or inventory is kept, and one by the front, side, and rear entrance. Or have all four cameras set up at different corners of your warehouse. If you own a convenience store, point one of the cameras at the cash register, one away from the cash register facing customers, have one near the back where the alcoholic drinks are kept, and finally have one in the store room. Even in the dark, these cameras see everything because each dome camera is armed with 24 infrared sensors. Like navy seals with night vision goggles protecting you from harm. Yes, the possibilities are endless, as is the peace of mind from knowing you've got eyes everywhere and the digital evidence to present to the authorities should trouble arise. Easy to set up, easy to use, and easy on the wallet too. If purchased separately the contents of this kit would easily approach $1000. With the SecurONE, you save almost 70% and everything is compatible right out of the box! Brought to you by the online leader in security and surveillance solutions...Chinavasion. Playback: Single channel / 4 channel simultaneous ! You can easily change the BNC connection to an RCA AV type with a simple BNC to RCA coupler adapter. Network video surveillance is through Internet Explorer only. You will need to turn on the Active X control for the browser to download a small Active X component to view the live video. This DVR unit is compatible with all BNC connector security camera types. Why can't I view the control page from my FireFox browser? For best results, please use Internet Explorer (with Active X enabled) or the provided evaluation software. Do the four cameras have audio? The camera itself cannot record audio, but you can connect an external mic for audio recording. Do I have to turn night vision on manually? No, the cameras each have a light sensor that detects light levels and switches to nightvision/IR mode automatically! I noticed that the video systems listed for the DVR unit are PAL and NTSC. Yet the dome camera color systems are only PAL. Is this a mistake? No, the DVR unit supports both types of signals in that it is compatible with many different types of cameras. The SONY dome cameras included in this kit are of the more popular PAL type in the event you wish to use the cameras as standalone devices. The equipment is very powerful and its features could be combined to form a tight home security system.I love it .